Bite into these colorful Rainbow KOOL-AID Cupcakes for a burst of flavor. 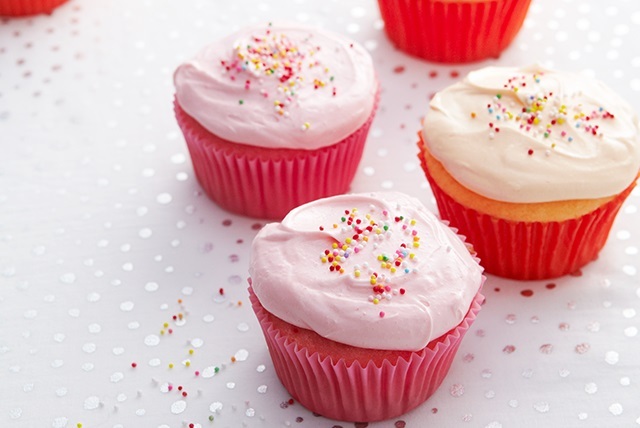 Make these KOOL-Aid cupcakes for the kids or invite them to help you bake these fun treats. You'll be in for a surprise when you take a bite. Prepare cake batter and bake as directed on package for 24 cupcakes, blending 1/4 cup (4 Tbsp.) dry drink mix into batter before spooning into prepared muffin cups. Cool in pans 10 min. Remove to wire racks; cool completely. Mix remaining drink mix with frosting in medium bowl until blended. Gently stir in COOL WHIP. Spread onto cupcakes.